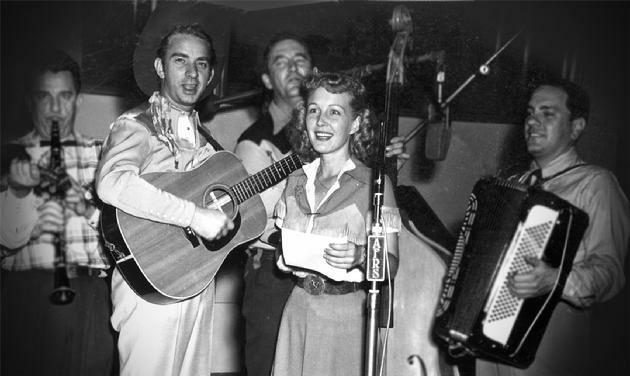 Carolina and Charley performing on the AFRS show "Carolina Cotton Calls", ca 1952. .Charles William Aldridge (aka Charlie Aldrich, and "Walkin' - Talkin' " Charley) was born June 3, 1921 in Bradley, Oklahoma. He was an only child, raised in Agawam by his grandparents. His grandfather, a cattleman who also traded cotton and broom-corn, didn't consider school a priority for young Charles. So Charley spent much of his early school years working on the stock ranch and doing chores. His introduction to music came when he received a $3.69 Gene Autry guitar for Christmas - a reward for hand-milking 40 cows a day. His life changed, spending every possible moment with his new guitar. Charley graduated from high school at age 16, and eventually found work with a dry-goods chain. A workaholic, he became one of their top salesmen. With the bombing of Pearl Harbor on December 7 1941, Charley (like so many others) immediately volunteered for Military Service. Rejected because of dental problems, he was later accepted by the U.S. Air Force and sent to Yale in New Haven, CT. As a Cadet, he was more than happy. Captain Glenn Miller and his band played for the Cadets' lunch every day. Charley was allowed to attend many of the band's rehearsals. After his graduation from Yale's Engineering School, Charley was then commissioned and assigned to Tinker Field at Oklahoma City. This was the Air Force's largest and most prominent airbase (with many Military VIPs visiting...among them Senator Harry S. Truman). He was scheduled to go overseas within 90 days, but had caught the attention of his Commanding General. Charley was then assigned to Engine Inspection for B-17s being overhauled. He was the only officer, working with 3,400 civilians & skilled mechanics. Because of his leadership and technical abilities, he soon became Captain. As the Chief of Engine Inspection he oversaw the inspection and overhaul of R-3350s, the powerful engines of the B-29s...the airplanes that eventually dropped the Atomic bomb and ended World War II. From Esquirs magazine, 1947. 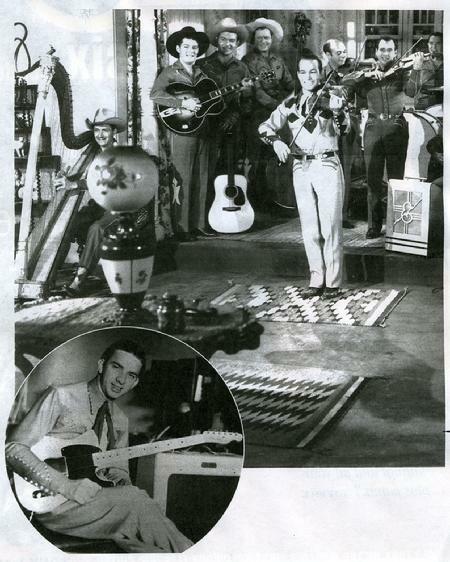 Charley with the Spade Cooley band. Once the War ended, Charley was offered his majority & schooling at the Air Force college that trained many Generals. But he declined, preferring to resume his cilivian life and his music. Fate stepped in and as a result of playing his faithful Autry guitar for some firemen, Charley joined the staff of 50,000 watt KOMA, the powerful CBS radio station in Oklahoma City. On the show "Oklahoma Roundup" the multi-talented Aldridge sang, played guitar, mandolin and banjo. (At the time he didn't read music but had a great ear & naturally talented. Later he became a proficient sightreader). The program did well and went nationwide. Charley did other radio shows as well, playing for Roy Rogers & Dale Evans, Tex Ritter and other known Western stars. He also befriended legendary guitarist Les Paul. When he learned of Paul's car accident, Charley visited him daily in the hospital. They became lifelong friends. Charley stayed at KOMA for 3 years before getting an offer from his visiting idol Gene Autry, to play guitar on his NBC Melody Ranch show. Aldridge happily accepted, moving West to California. Once in Los Angeles, Charley enrolled at the prestigious Los Angeles Conservatory of Music, April 1948. There he studied guitar and voice. He was a dedicated student. Between his radio performance, he'd often catch up on sleep in his car in front of the school before it opened. It was all worth it, as he was a top-notch graduate. Charley joined the Local Musicians Union 47. But the Union didn't offer many jobs to new members. So in 1948 he became a temporary door to door salesman selling pots and pans, & sold shoes at J.C. Penney to make ends meet. 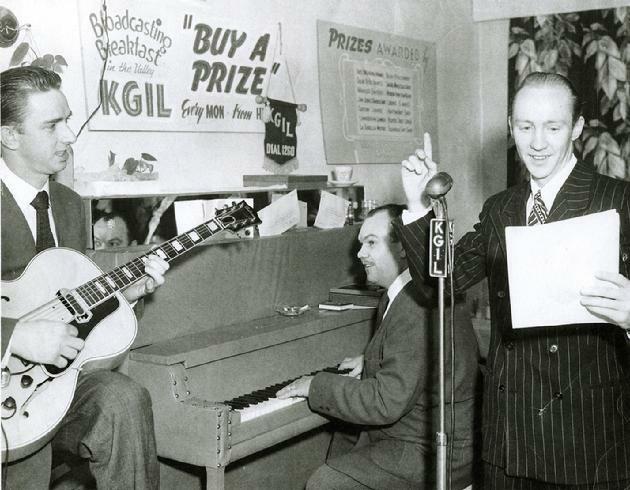 Then Spade Cooley (top bandleader at the time) heard Charley play and convinced the Union to be allowed to hire him for Cooley's TV show on KTLA, which was LA's top rated program at the time. The big 17 piece ensemble would drown out Charley's guitar amplifier (made by his friend Les Paul and used for recording "How High The Moon", among others). It was great for Les and his more intimate performances but it wasn't loud enough for a big band. So Aldridge called Leo Fender. They bonded and for the next 40 years, Fender furnished most of the instruments he and his band members used. Charley Aldridge was quickly making a name for himself as one of Los Angeles' top entertainers. He played in several honky-tonks and was also doing some recording. In 1949 he appeared on Cliffie Stone's "Hometown Jamboree" and worked with Tennessee Ernie, Merle Travis, Ferlin Husky and other greats. He also became the comedian of T. Texas Tyler on his weekely KTTV program. Before long, Charley was wearing fancy Western suits created by Nudie, the famous tailor. 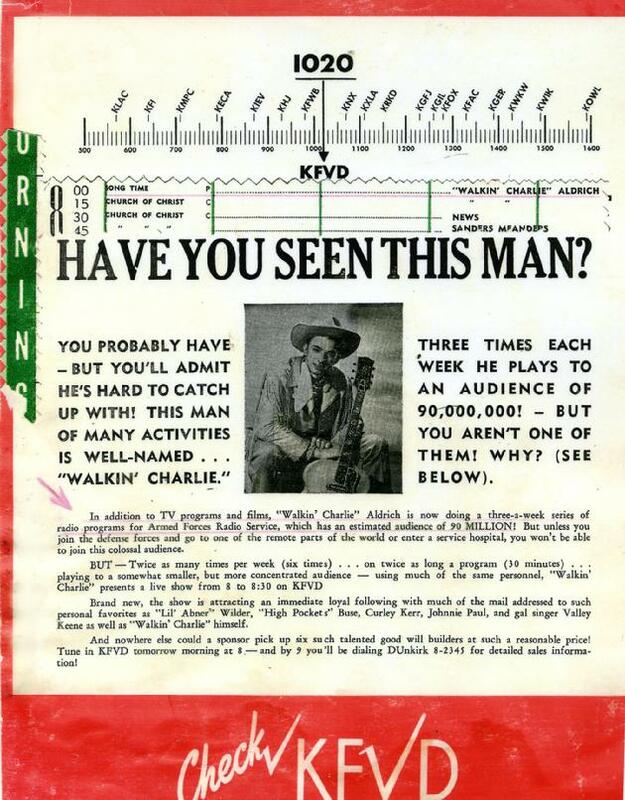 Along with his TV and live appearances, in 1950 as DJ "Walkin' Charley" he returned to radio on LA's top country station KXLA. This led to other radio appearances including KGIL-KFVD & a station in Inglewood. But before long he set aside being a disc jockey to host the daily television show "Range-Rider's Movie Roundup" on KTTV (1949). 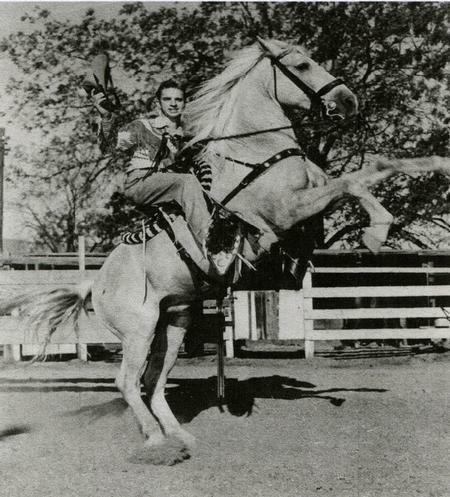 He played 2 roles on the show, and included his Palomino named Ranger, and his trick mule Fluby. This award-winning kids' program led to Charley serving as Grand Marshal at parades at the Los Angeles Coliseum and other surrounding cities, including the famous Hollywood Christmas Parade. And there were Ol' West shows at the Hollywood Bowl, the L.A. County Fair, and Culver City Stadium. Claus"), Wynn Stewart and Annette Funicello. The Big Wigs in Show Biz were watching and discovered these future celebrities. Sometimes Charley would feature off-beat talent. One such frequent guest was Eden Ahbez, the "Nature Boy". He dressed in his long brown robe, sandals and long Biblical style hair. Eden was also the composer of the song "Nature Boy", sung by Nat King Cole. Meanwhile, Charley kept up with his guitar skills, studying whenever he had the time. Among his teachers were Barney Kessel, Allen Reuss, Red Varner, Al Hendrickson, Doyle Salathiel and the great Johnny Smith. While being involved in his many activities, by 1957 Mr. Aldridge added yet another endeavor: leasing the Riverside Rancho dance club. He also performed there. After Leo Fender had designed his electric violins, Charley added musicians to form a 12 piece ensmble. There were weeks of rehearsals with Leo and the Fender personnel every Friday night, to help improve the sound of the Aldridge band. Another special musician friend, Buddy Mize, also gave helpful advice. Buddy eventually relocated to Nashville and headed Central Songs, the Capitol Records Publishing Company. In time, Mize organized the Nashville Songwriters' Association and became its President. When the fine-tuning was done, the Rancho showcased a stellar lineup of entertainment, including Bob Wills & His Texas Playboys, Lefty Frizell, Marty Robbins, Jim Reeves, Bobby Helms, Smokey Rogers, Billy Strange and Nancy Sinatra. Because of having starring roles on other TV stations at the time, Charley decided to take on another name. He was also known as Walkin'-Talkin' Charley Aldridge. Charley also did the Grand Opening of Corriganville Movie Ranch. He was only hired for one day, but ended up staying on for eleven years. Drawing big crowds, he produced live shows based on the O.K. Corral and other classic Western events. Assisting Aldridge were "Slim" Duncan and stuntman-organizer Jerry Vance. Both of these men went on to do movies and stuntwork, as did other personnel of the show. Corriganville was a big success. Stars such as Frank Sinatra, John Wayne and Lee Marvin filmed at the Ranch. And Charley was often there, bonding and working with these celebrities. 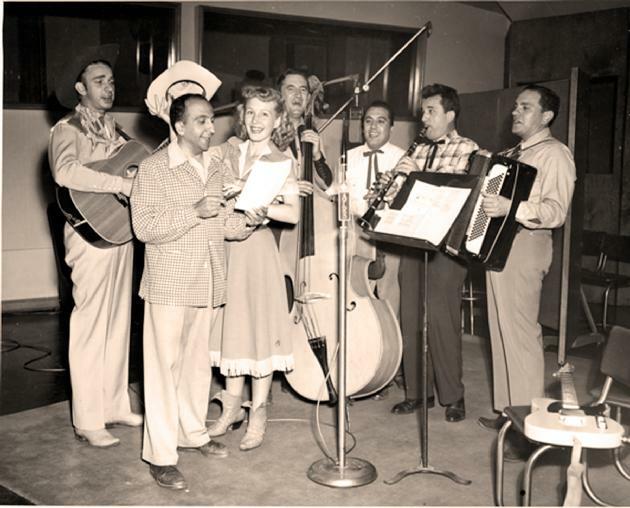 By 1952, Charley became the Emcee and bandleader on the AFRS radio program "Carolina Cotton Calls", featuring the Yodeling Blonde Bombshell, Carolina. It was broadcast around the world and was a big favorite among the GIs. Charley sang and played guitar on the early episodes. He also hosted and used his band on a weekly worldwide program that starred Nat King Cole, Jerome Courtland and others. Charley created another well-known TV show, "Town Hall Party". It was a "biggie" in the LA area for many years. After producing the live shows at the Lone Ranger - Corriganville Movie Ranch for many years since '49, Charley chose a new location for these shows and in 1960 leased the Paramount Movie Ranch. However, the (dry) creek on the property ended at Ronald Reagan's swimming pool a mile or so downstream. The county officials intervened, restricting the shows to one weekend per month. But he continued working in film. Charley co-starred in the Morrison produced TV pilot, "Guns Of The Lawless West", & in '62 he co-produced "Ballad Of A Gunfighter", starring Marty Robbins. Charley's wife Claudette then received word from the family doctor that their youngest son, Duke, needed a change of climate. So Charley began a new role as road manager and musical conductor for the stars who performed at State Fairs and rodeos. This top notch list included Clint Eastwood; Clint "Cheyenne" Walker; Ken "Festus" Curtis; Jack Lord; Doug McClure; Lorne Greene, Big Dan Blocker and Michael Landon of Bonanza; Irene "Granny" Ryan, Donna "Ellie Mae" Douglas and Max "Jethro" Baer Jr. of The Beverly Hillbillies, among others. Charley and Claudette had immediately changed their lifestyle, traveling across the US. At times when two of their clients were performing at the same time in different locations, Claudette would oversee one group while Charley looked after the other, flying back and forth. As Charley played look-back, he grinned "Yeah, it was hectic at times but we got it done!" When they went to Phoenix, Charley discovered Apacheland...a run-down Movie Ranch built for the TV series "Have Gun - Will Travel". It wasn't long before he was hired on as manager, and soon the couple became part-owners of the Ranch. Due to Charley's management, the show "Death Valley Days" returned to Apacheland to film. 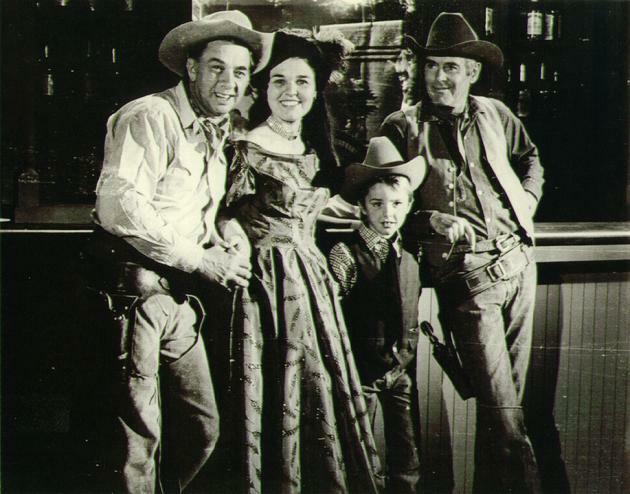 The hosts of the program included Ronald Reagan, Robert Taylor and Dale Robertson. Being a great planner, Aldridge later arranged for the filming of "Charo" (starring Elvis Presley) and "The Battle Of Cable Hogue" at the Movie Ranch. A bout with Valley Fever took its toll on Charley, and he was forced to leave the Ranch. His family then settled in Nashville. There, aided by his good friend Clint Walker, he bought 400 acres and had built Fort Aldrich - a Western amusement park. Walker opened the park and drew almost 20,000 people...and then tore up the paycheck Charley gave him for his appearance! The park did well for awhile with appearances by the likes of Clint, Dan Blocker & Rick Jason. During the following winter, Charley was the Ringmaster of The Nashville Shrine Circus. He also did shows for Circus great Eddie Zuchinni, head of the Circus that shot people out of cannons. Unfortunately, the Charley and his family were forced to close down Fort Aldrich, because the Nashville - St. Louis Highway was scheduled to be build through the middle of it! Weary and dejected, Charley moved to Las Vegas. It wasn't long before he and the talented singer Betty Luther put together a show for The Stardust Hotel and Casino. But they quickly closed down the show, and Charley became restless, as Show-Biz in Vegas just wasn't his cup of tea. Once recovered from Valley Fever, Charley and the family returned to Nashville in the late 1960s. This time, it was to operate WENO radio station's amusement park, and later to organize song publishing companies for Loretta Lynn. But once again, Fate stepped in. When Claudette's father had fallen in an accident, the family left Nashville and intended to move back to Los Angeles to look after him. Thankfully her father slowly recovered. But the owners of Apacheland (which had burned down and soon rebuilt) followed them to LA, hoping to rehire them. Thankfully Claudette's dad regained his health. The family accepted the Apacheland's offer, and in 1971 Charley returned to manage the Movie Ranch in Phoenix. This time, in addition to rebuilding a large cast, Charlie also helped film "Second Chance! ", a made for TV movie starring Brian Keith, Elizabeth Ashley and Juliet Prouse. Later, after writing a script for a Universal Pictures movie filmed at Apacheland starring Marty Robbins, Charley sold his interests in the Ranch, moving his family back to Las Vegas. 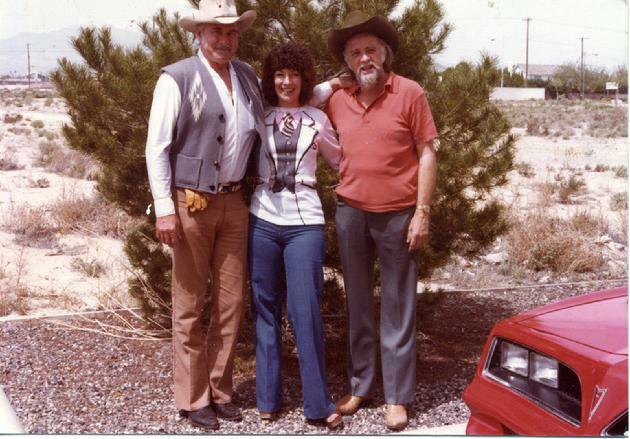 In '72, Charley and Marty had planned a Marty Robbins Movie Ranch in the area, and Aldridge worked for a year or more on the project. Land was secured from the city of Henderson. Unfortunately, too many homes and high line poles surfaced near the Ranch site, so Charley quit the project. But he did continue working with Robbins, scoring & conducting the music for his friend for his Universal picture "Guns Of A Stranger", which used 12 Mancini strings. Another endeavor was taken by the Aldridge management. Etching artist Roy Purcell's work was showcased in 140 galleries nationwide, including: Charlie Russell's in Great Falls, Petersen's in Beverly Hills, and on the "Wheel Of Fortune" TV show. Now older, and settled with his wife Claudette in a comfortable home, Charley took stock. Over the years, he has recorded several songs, including "A Dear John Letter!" (1953), & "Scroungy Man" (1958). Having written songs that were recorded by Gene Autry, Porter Wagoner, Chill Wills, Marty Robbins, Lorne Greene, Loretta Lynn and others, Mr. Aldridge built a huge room with a state of the art (analog and digital) recording studio. In this private recording facility, with the great talents of Chris Crump (a fine musician and engineer), Charley turned out several songs intended for Nashville's finest. Charley not only wrote songs in his studio but also books, among other projects. He had been ghostwriting for a long time on Western novels, articles and non-fiction articles...plus books for prominent stars. Some of his newer books had been made available online. 'When you're playing the final Theme don't goof off, for we're gonna cut to the White House, so that President Eisenhower can read a Tribute to the City of Abilene over your playing!' Well, somehow I got through the Show without messin' up, but immediately afterward I called my Agent and told her not to book me on such Shows anymore. 'But why not?' she asked. 'It pays you $400 dollars'. 'I don't give a damn!' I retorted, 'I've already got $400 dollars!' " Thankfully, that Agent didn't obey Charley's protest. He continued to play, sing and create projects that have entertained millions of folks for many years! Jock Mahoney (L) poses with his friend Charley Aldridge (R) and unknown woman in the middle. Photo taken around 1979. (Special thanks to Claudette Aldridge for providing Charley's bio and photos). CHARLEY'S SONGS ON YOUTUBE (as Charlie Aldrich): These are just a sample of the many songs Charley Aldridge has played & sang on over the years. 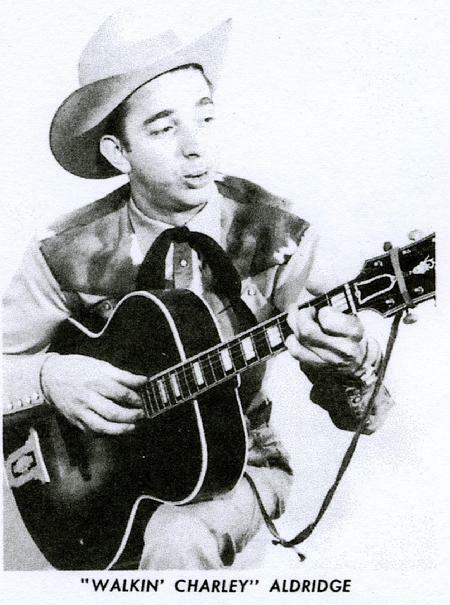 "Kensey's Book", a Western Swing song, was released in 1953. Several years later he recorded a great rockabilly number, "Scroungy Man", along with "Hot Sake" and "Walkin' Alone". He remained active in recording for many years.